Conjugated polyelectrolytes are conjugated polymers that feature ionic side groups which render the materials soluble in water and other polar solvents. In this review we summarize recent work which has been carried out to synthesize a variety of new conjugated polyelectrolyte structures, including those with poly(paraphenylene), poly(phenylene vinylene) and poly(phenylene ethynylene) backbone structures. Work that has examined the optical, photophysical and solution properties of these materials is also reviewed. 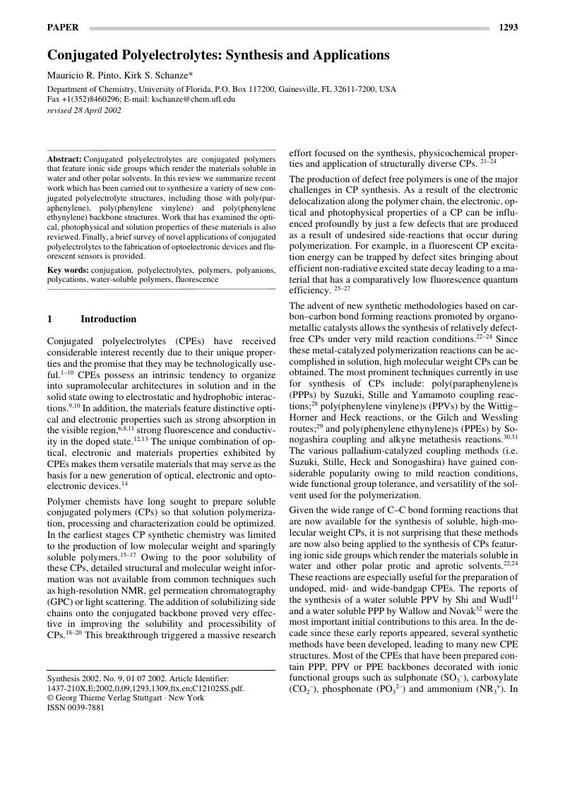 Finally, a brief survey of novel applications of conjugated polyelectrolytes to the fabrication of optoelectronic devices and fluorescent sensors is provided.